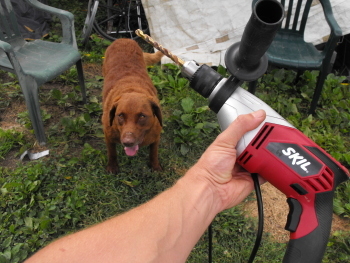 The new Skil drill got a workout the other day when I needed to make a hole through some cedar posts. I was surprised to see just how much more leverage the side handle gives you. The 1/2 inch chuck allows for the bigger size bits and the extra 7.0 amp motor provides more than enough power. There's a nice rubber holder near the handle to hold the chuck key and the speed is adjustable depending on how hard you squeeze the trigger. This should make mushroom log plugging a lot easier when it's not doing duty as our main motorized mechanical smasher.